The aradhane of one of the most important seers of the Raghavendra Swamy Matha just concluded. The second seer to occupy the post of the Sri Matha after its founder Vibhudendra Theertha, he did not enter the Brindavana alive or dead. He vanished into thin air after the swirling waters of the Krishna covered him. Known as Jitamitra, he was the head of the Sri Matha for a short time-from 1490 to 1493. However, this duration was enough to place the fledgling Sri Matha on a firm footing. The Aradhane of Jitamitra Theertha was celebrated on December 24. It is believed that in his next avavtar Jitamitra Theertha became Sudhindra Theertha-the Guru of Raghavendra Theertha or Raghavendra Swamy, while his Guru-Vibhudendra Theertha took avatara as Vijendra Theertha. Jitendra Theertha had visited Bichale during one of his visits and he planted the Gum tree or Gona (in Kannada Gone means Gum) which in later years Appancharya made use of to cook rice. Though the tree was destroyed by the floods of the Tungabhadra river in 2009, a sapling of the original tree still exists. 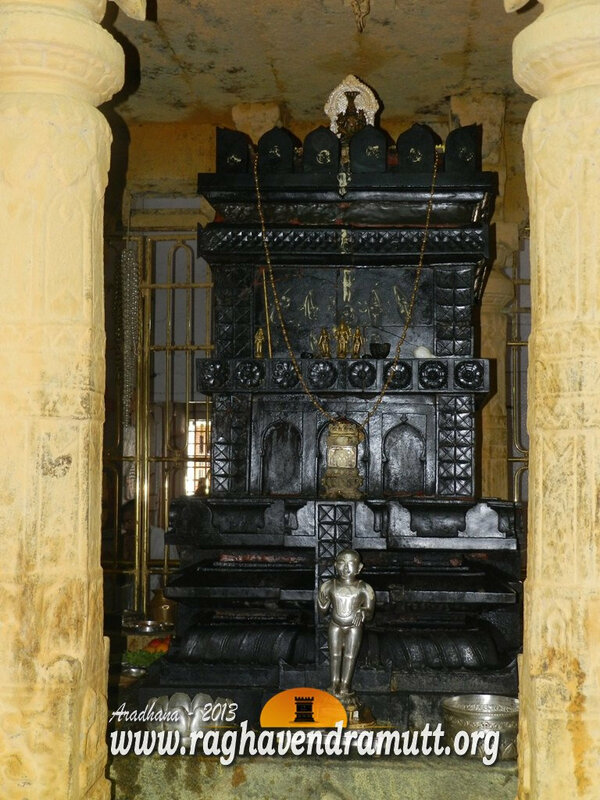 Once Jitamitra Theertha was teaching his students in December 1493 at a place now known as Jitamitra Gadde, 32 kms from Raichur Krishna-Bheema river basin in Shivapura of Shahapur Taluk in Gulbarga district. The Krishna was then in floods and the water level suddenly rose, inundating several areas. The students and others ran away, leaving Jitamitra Theertha behind. Soon, the seer was engulfed by the flood waters and for a week the waters never receded. On the seventh day, when the waters receded, the disciples, students and others were astounded to see Jitamitra Theertah still sitting under the tree. When they went near, they found the seer was not wet and that his body remained bone dry. He subsequently disappeared from the very place into the Gum tree and today there is a memorial at the spot denoting the place. There is, however, no brindavana for Jitamitra Theertha. He is the fourth Madhwa saint after Madhwacharya and his brother Visnhu Theertha of Sode and Subramanya Matha and Brahamnye Theertha of Vyasaraja Matha to disappear. Today the tree still stands and it is worshipped. The area around it is called Jitamitra Gadde, as small island which is approachable from Raichur and Gulbarga. Jitamitra Theertha’s Poorvashrama name was Ananthappa. He had lost his father at a very young age and the responsibility of bringing him up fell on his sister who had become a widow. The upanayana of Ananthappa was conducted when he was eight. He assisted his sister in grazing cattle, ploughing the fields and sowing seeds in Shivapura, a small village in Gulbarga district. They both together worked in their fields to make ends meet. Every morning, Anantappa performed sandhyavandana and other poojas. He then joined his sister in the fields. Since he had to work, he took out the sacred thread-Janavara- and hung it on a tree. Once Vibhudendra Theertha happened to pass by and he noticed Ananthappa. When told the boy was a Brahmin, the seer asked Anantappa where his sacred thread was. Ananthappa replied that he had hung the thread back home as he had to plough the field. Vibudendra Theertha then taught the boy the importance of never removing the sacred thread. He then visited the house of Ananthappa and spent time there. He performed the pooje of Moola Rama and gave daily discourses. After some time, he gave a Narasimha saligrama to Ananthappa and asked him to worship it. By then, Vibhudendra Theertha realised that Ananthappa was none other than an avatar of Rudra. After Vibhudendra Theertha left his house, Ananthappa regularly performed Saligrama pooje. When he performed the Saligrama pooje the first time, he offered Naivedya to the Saligrama. When the Saligrama did not take the Naivedya, an angry Ananthappa decided to hit himself with the Saligrama. When there was no response, he began hitting his head with the Saligrama. The Saligrama then opened its mouth and ate the Naiveidya. Soon this became a regular routine. Meanwhile, Vibudendra Theertha who had gone on sanchara to north India came back to Shivapura. When the seer was told about the Saligrama accepting food, he decided that he had found the right disciple to hand over the ashrama. Vibudendra Theertha then gave sanyasashrama and the Samstana box to Anantappa and named him as Jitamitra Theertha. He then entered Brindavana at Tirunelveli in Tamil Nadu. There are many miracles associated with Jitamitra Theertha. If you are coming from Raichur, get down at the railway station and Jitamitra Gadde is 50 kms away. You can either take a bus or rail. The Intercity Express leaves Raichur at 7 a.m. Get down at Saidapur station (Narayanapet Road) and take an auto or vehicle from here. Take the Mungal – Sangwar -Kondapur -Joladagi barrage/ bridge – Gwanal –Shivapur route and you will stop at Jitamitra Gadde. The distance from Saidapur station is approximately 30 km. For bus route from Raichur take the Gabbur- Googal Bridge / Barrage- Bendegambli- Shivapur route which ends at Jitamitra Gadde. The distance is approximately 80 km.